Fluxus Garden, Paul Chartrand, 2012. Image courtesy of Paul Chartrand. 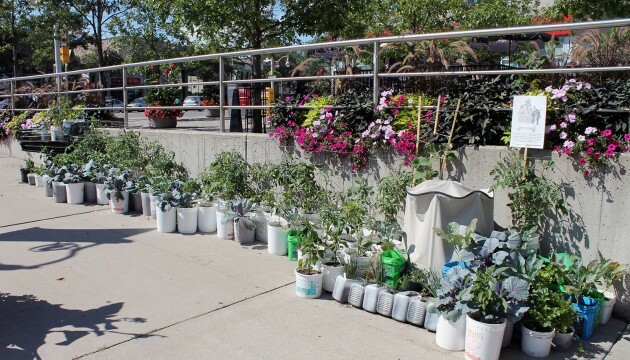 As a response to the growing problem of food security for Guelph residents, Paul Chartrand created Fluxus Garden, a modular garden in St. George’s Square. Guelph is a mid-sized city with no affordable grocery store downtown. The artist created small, portable planters made with recycled materials were offered to individuals and groups wishing to experiment with DIY farming techniques and grow their own food in the Square. This compartmentalized community farm served as a hub for hands-on learning about urban agriculture and the possibilities of easy proch-top mobile gardens. Food can be a strong symbol for hope and empowerment. The politics of food and hunger experienced by some are a hidden reality for many residents of Guelph. As a feature of the Musagetes Guelph Café, the artist offered the community homemade bread and soup made from ingredients grown in Fluxus Garden, which built awareness of food production and offered a point of reflection on local food politics. In the spring of 2013, Musagetes invited the Guelph community to propose artistic interventions for St. George’s Square: re-situations, reminders, or recognitions of this place at a time when many downtown social activities and amenities is shifting to the nearby Market Square. With the buses relocated to the VIA Rail/GO Transit station, and a new ice rink and splash pad in front of City Hall, is St. George’s Square still a public space for gathering or has it been reduced to a traffic artery through the centre of the city? What makes public space useable or defunct? We asked the Guelph community to propose interventions that would foster new uses of one of Guelph’s most important public spaces: St. George’s Square.